Control system power and grounding is possibly the single most important element to ensure a control system doesn't experience unidentified "gremlins" throughout its life. The topic is appropriate to every control system domain, including programmable logic controllers, process control systems, robotics, vision systems, etc. Power and grounding is recognized by a major industry standards organization, ISA, in ongoing standards efforts. 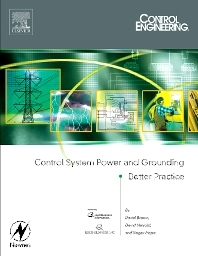 Control Engineering and several power and grounding experts have developed this control system power and grounding resource. When used in conjunction with control system manufacturer installation documentation, users can expect robust, reliable control system installation; one that remains free of "phantom" problems caused by power and grounding glitches. The only single source control system power and grounding guide available. Details how to significantly improve reliability in control systems, saving valuable time and money.